You really want to read about pension funds, don’t you? Pension fund talk really gets the blood flowing, doesn’t it? Well, we’re going to try our wonky best. The paper’s discussion of the default rule is an interesting window into how thinking about default rules for investments has changed over the past decade, and how policymakers in different countries may end up addressing this issue. From former CBO director and soon to be Office of Management and Budget director Peter Orszag. The overall share of 401(k) participants with 90 percent or more of their assets invested in company stock is more like .47*7.3=3.4 percent. It’s still too high…The good news is that the trend is towards less investment in company stock. 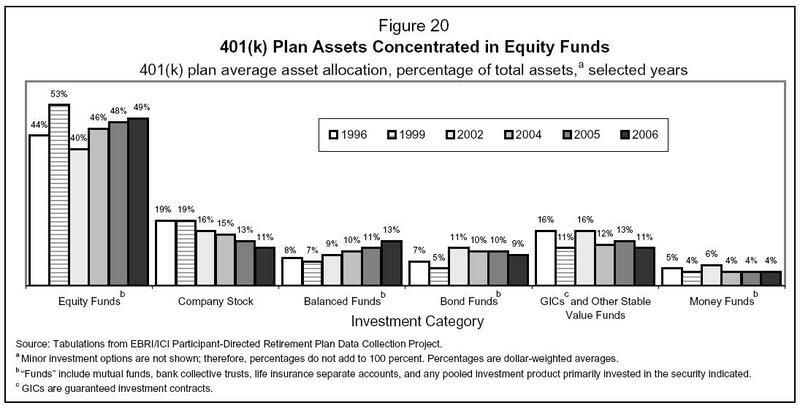 For example, in 1999 EBRI estimated that 19.1 percent of all 401(k) assets were held in company stock…By 2006, that share had fallen to 11.1 percent. The figure below, which shows this decline, comes from the Employee Benefit Research Institute. The company stock figures are the second batch of bars from the left.